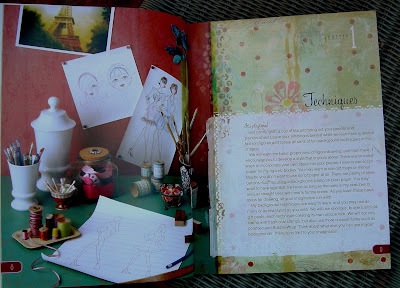 Julie Nutting Designs: Could it Be? It has been a most dreadful, stressful week. One of those weeks where nothing goes right from pressing the start button on a copy machine that won't make 900 copies to bill mix-ups that require being put on hold with at&t for an eternity! More car issues, our dog of 15 years getting ready to leave us, yep, it's been one of those weeks, where you really have to press into that inner being for the positveness and the learning and growing experiences that come from one of those weeks! I come home from a morning of madness to find a lump under the doormat. Is it? Could it be? It is!!!! It's my book! two copies of my.....MY book. 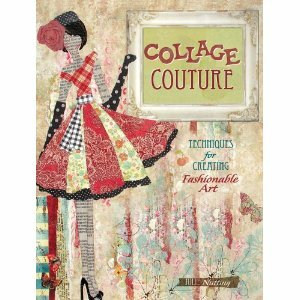 Collage Couture. I ate my lunch really, really fast and then sat down and savored the pages...one by one. Every page, prettier than the last.Then it dawns on me. It's not just MY book. It's a whole team of creatives...editors, photographers, and designers that translated my words, feelings and art into this beautiful little book. This book just really captured exactly what I wanted it to. 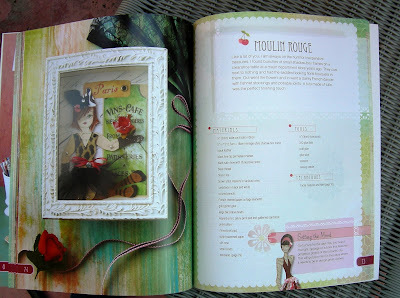 It's whimsical, girly and I hope inspiring. The photos are nothing short of stunning. The design IS me and yet I had nothing to do with the design. Northlight Books is just a giant group of the most talented, creative people, who after spending a week with me captured my spirit into 128 pages of pure bliss. Oooh, it looks so PRETTY! Can't wait!!! I can't wait to get mine!!! You must feel so awesome right now!!! Good for you sweetie!!! You deserve it!!! Hope its sells MILLIONS!!! Looks like a good one!! Congratulations! Sorry about your dog. You will have to let me know where I can get it. And when is it released? I MUST have this book. And how do I get my copy signed? LOL. Julie, congratulations!!!!!!! Can't wait to get my hands on one. Julie, how wonderful! Of course I want one, but it has to be signed by YOU! Will you get any to send out with your signature? I don't think I can make it to CA for a book signing, LOL. Anyway.....best wishes and I'll be telling all my artsy friends to get a copy! Way to go, Julie! It looks beautiful... I of course want a signed copy just like the rest of the Keys group! We are all whiners, can you tell? So do tell us how to get one as soon as we can! Can't wait to see it! I, too, will spread the word and tell all my friends about it and YOU! Congratulations, Think positive! "It WILL see millions!!!" I agree with Eileen! I want one signed by YOU!!!Please??? Congrats, Julie! As usual, I'm jumping on the bandwagon of admirers wishing you continued success and hoping to find out how I can get an autographed copy. It looks great! I can't wait to get a copy. Julie I am SO THRILLED for you ! Your labor of love and the amazing team of talent at Northlight Books have created a jewel of bound inspiration and girly girl fun for all ages. LoVed the sneak peak at the beautifully styled pages and your creative writing encouraging the reader to be playful and imaginative ! Thank you for sharing the delicious tidbit. So girlfriend, what's it like floating on cloud 9 ? I'm so glad you love your book! It was great to be your editor and work with you on this project. Congratulations! I have loved your art work that was featured in the Somerset magazines and I am looking forward to your book. When does it release? Amazon doesn't show a date yet.